The Sengoku Basara Magazine website has now updated along with a preview article on the Dengeki site. 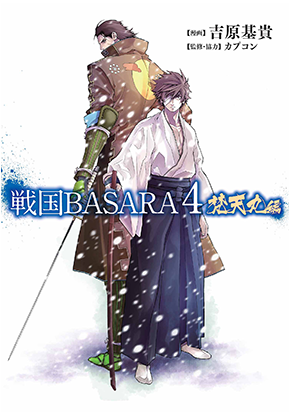 The correct reading of the name of the new scenario novel is apparently Sengoku Basara 4 Sumeragi Riten Daisakai ('The Grand Tea Ceremony Cast Out From Heaven'). My copy won't arrive in the UK for a few days so I'll summarise the information I've found about the new issue so far. The website update formally confirms that Sengoku Basara 4 Bontenmaru-hen will be released in compiled book form on 26th September 2015, priced at ¥616. They also included the cover artwork, which is rather understated for a Sengoku Basara manga. 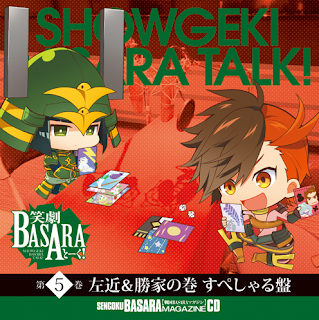 The previously-announced Showgeki Basara Talk! Vol. 5: Sakon & Katsuie No Maki Special-ban talk CD scheduled for 26th September 2015 now has its own cover artwork as well, drawn by Sumeragi. As a reminder, Sen No Rikyuu's seiyuu Sakurai Takahiro will appear as a guest and the BASARA CHALLENGE skits will be the family restaurant one from the last issue of the magazine, an episode about working as lifeguards at a pool and an exclusive bonus skit about a promise at an athletics meet. 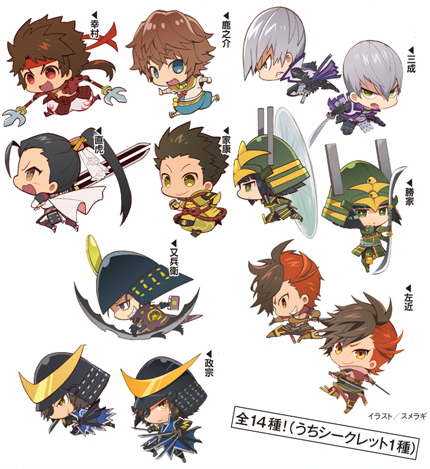 Next, remember these cute designs which are being used for the upcoming Mame Sengoku Basara 4 Trading Rubber Strap Collection? There will also be a set of Mame Sengoku Basara 4 Trading Can Badges available for the same characters priced at ¥324 each or ¥4,536 for a box. Preorders will open in late September ahead of their Autumn 2015 release date. Finally, there's one sad piece of news, especially for those who had been eagerly waiting for their favourite characters to appear on the cover of the magazine. Twitter user @tobitaka626 posted a snapshot showing that the final page has a message for the fans instead of the usual preview of the next issue: "Thank you very much for reading up until volume 10! Sengoku Basara Magazine is certain to return, so until that time..."
I hope it really does come back someday. I was never expecting them to keep it going for this long, but it's been such a treat to get all of this Sengoku Basara content in a single place every few months that it will be sad to lose it. There's still a regular Sengoku Basara section in each month's issue of Dengeki Maoh, of course, but does this also mean that the Wan-Nyan Sengoku Basara manga and the scenario novel series have finished for now? I'll try to work on translating the character background columns from Dengeki Maoh periodically to make the wait for more news about the magazine a little better. I guess they can only pump out so much new content for each installment and with no major game release on the horizon they probably wanna save some stuff for the anniversary book... It's still very disappointing. Maybe with luck the next run will go with other characters rather than the ones they already covered... by no means trying to snub the people who love them! They ARE "posterboys" for a reason. But it'd be nice to have some other characters highlighted too. It wouldn't even have to be Kenshin n Kasuga. I'd gladly take Oichi or Nagamasa or Hideyoshi or Hanbei or someone else of moderate popularity. Poor Keiji, left out again! I'm not surprised that they stopped after running out of the big poster boys but it'd be nice too have more characters featured, like the ones you mention. It's all about selling enough copies though isn't it. Cutie Hanbei could perhaps attract some buyers? IDK. Looking forward to read some character background columns. Yeah, there are so many characters who deserve a new CG illustration too; even Yukimura and Ieyasu are still waiting. I'm hoping (perhaps unreasonably...) that the magazine is being put on hiatus because the team is too busy to keep working on it rather than because the sales were poor; Sakon's issue sold very well and Sasuke's seemed to perform decently in Amazon's rankings too. It was only recently that they were asking about which character should come next! On the bright side my copy of the (for now) final magazine should arrive this evening so hopefully I'll get some time to write all about it this weekend.